On this date in 1718,* the vengeful tsar Peter the Great staged a horrible execution on Moscow’s Red Square. Stepan Glebov was the collateral damage of Peter’s ferocious conflict with his ill-favored crown prince Tsarevich Alexei — the whelp who had only recently been repatriated to his glowering father after fleeing Russia altogether, to cap a lifetime of letting dad down. Alexei was back in Peter’s clutches, and a few months from the events in this post would be shockingly knouted to death at Peter’s orders. This Freudian clash also mapped sharply onto Russia’s political schisms (and many of the links in this post are to Russian pages). 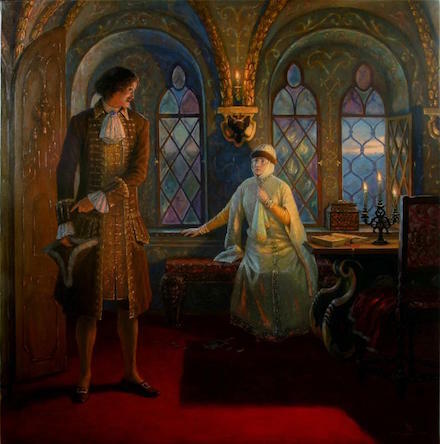 Alexei was the son of Peter’s first wife, Eudoxia [or Evdokia] Feodorovna Lopukhina, a princess whom the teenage Peter had been required to wed as part of the political logrolling involved in overcoming the 1680s regency of his sister Sofia. Peter had achieved that victory, definitively, and once it was secured it didn’t take him long to tire of both Eudoxia and of the stagnant boyar class she represented. Peter was all about westernizing the motherland; what better way to start than by immuring his Russian bride in a monastery** and grabbing a German merchant’s daughter for a mistress? The blows were borne together by Eudoxia, by her devout son Alexei, and by that part of traditional and Orthodox Russia horrified by Peter’s innovations. Resentments ran along the familiar channels, here to an immoderate fantasy of deliverance come Peter’s death and there to dangerous plans to immanentize same. When exposed by to Peter’s hostile gaze little distance would there seem between these varietals. When Alexei returned to face Peter’s investigation, the old man turned his harsh scrutiny on the ex, knowing her to be a locus of opposition. She was found living outside the monastery in secular garb, having taken an officer named Stepan Glebov as her lover. Their correspondence was ransacked by persecutors determined to discover indicia of treasonable scheming therein. Dozens of associates and monastery monks and nuns would be caught up in the affair, damned for anything from failing to prevent the former queen’s dalliance to plotting against the life of Tsar Peter. Most were stripped of rank and sent to exile with various forms of corporal punishment — whipping, severed nostrils, tongues sliced out — but several would be tortured to death or executed on the breaking-wheel including Dositheus, Bishop of Rostov, a confidante of Eudoxia who had allegedly prophesied Alexei’s triumph over his father, and Alexander Kikin, a mentor of Alexei’s who had helped to arrange his escape from Russia. But upon Glebov, miserable man, Peter would give free rein to his amazing talent for cruelty: the lover to be impaled alive on a stake artfully inserted to miss all vital organs so as to maximize his suffering; some accounts even give it out that the naked Glebov was bundled in furs for the freezing winter’s execution, that he might endure his pains the longer. 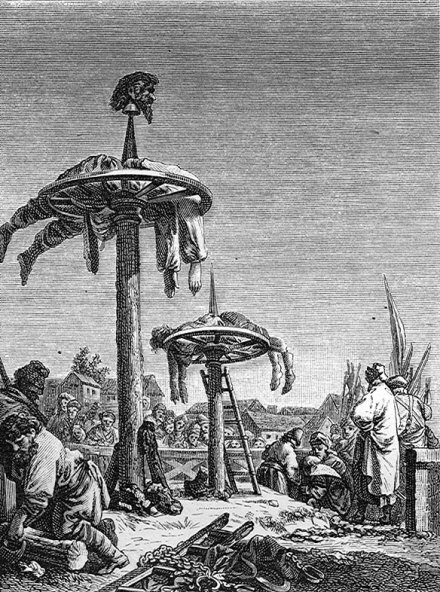 Eudoxia’s brother Avram was also put to death in December 1718. She herself was shut up in Shlisselburg fortress for the balance of Peter’s life, but she would survive to see her grandson (Alexei’s son) take the throne in 1727 as Peter II. * Julian date: it was March 26 on the Gregorian calendar. The New York Times of Dec. 30, 1900 provides this date’s entry, featuring the unusual scene of a woman being broken on the wheel. This day, a man and a woman, a burgher of the towne being the womans master, for murthering, were carted from the prisone to the house where the murder was committed; and there before this house, with hotte pinsers, the flesh was torren out of their armes, and from thence were carted to the place of justice without the towne, and there broken and layed on wheeles. Executions by breaking wheel: early 18th century engraving. (Source: Wikipedia).